Black Mirror, whether it’s the original British incarnation or the Netflix-backed continuation, is a show that’s almost predictable in its unpredictability. Being an anthology show, it’s pretty much impossible to say how a given episode will play out, but barring at least one very memorable example, you know that things are going to play out in a bleak and horrifying way that makes you question everything from your dependence on technology to your reality itself. So, while Netflix has released a pair of preview photos that tease the upcoming fourth season of Black Mirror, it’s hard to tell what the episodes they’re from will actually be about. Still, that’s not going to stop us from making wild guesses. This photo is the more straightforward of the two, which also makes it the most concerning. We know this is from an episode that Jodie Foster directed called “Arkangel,” which stars Rosemarie Dewitt, Brenna Harding, and Owen Teague, but that’s all we know. Based on the image, we’d have to guess that it takes place in a futuristic pediatrician’s office, and the stick that the doctor is holding does some kind of brain scan. Maybe it can tell parents if their child will grow up to be evil? Or maybe it’s actually a laser hairbrush of some kind, and this is actually a high-tech stylist? 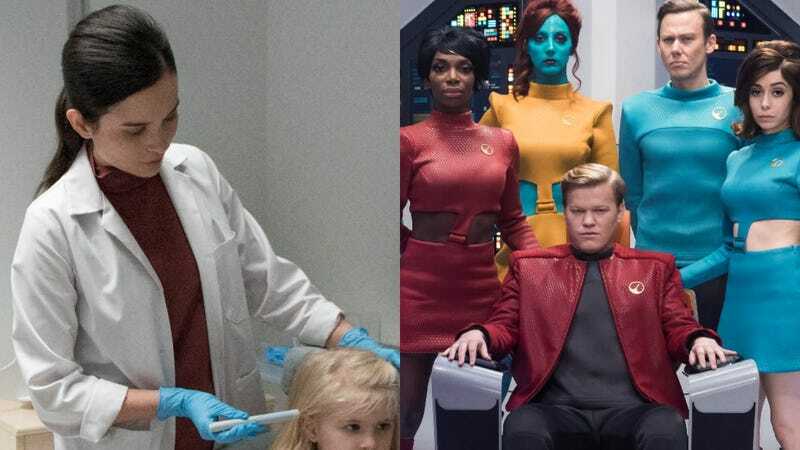 This second photo is clearly the big showpiece of Netflix’s press release, though, since it seems to feature Jesse Plemons as the captain of a starship, with Cristin Milioti and Jimmi Simpson on his crew. The timing of this is pretty vicious, with reviews for Seth MacFarlane’s own Star Trek homage just coming out, but the fact that this looks super fun and weird probably means it will be even more horrifying than the laser hairbrush up above. This episode is called “USS Callister,” which is either the name of Captain Plemons’ spaceship or some kind of nanomachine drug that makes you think you’re a starship captain before it kills you, and it will be directed by Doctor Who veteran Toby Haynes. Fun with overanalyzing preview photos!